Daily Mass Chapel Altar Window, Saint Peters Church, West Brandywine Township, PA. 60" in diameter. Hand blown German glasses, vitreous glass paints, lead. 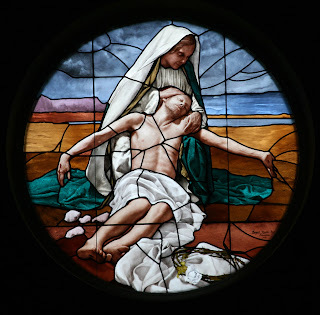 This contemporary interpretation of the Pieta began with digital photography. Models, dressed in traditional garments were arranged, dramatically lighted and recorded. Here the best computer imaging technology is partnered with techniques of vitreous glass painting rediscovered in the restoration of early 20th Century Bavarian windows. The goal was to create a new style of art glass window for 21st Century Churches that acknowledges the trend back toward traditional design. A style that is both familiar and challenging for a contemporary audience but without the once-upon-a-time sentimentality popular a century ago. For more information on Joe Beyer Studio please click here. The anchor is an ancient Christian symbol of hope in Christ. Given its origin in catacomb imagery, a genre that developed during the earliest persecutions and required some subtlety, the Christian meaning may not be immediately apparent. Yet we find the cross hidden within the symbol: the crosspiece of the anchor reveals the cross of Christ and represents his redemptive action upon that cross, the object of our hope. It is this hope which grounds the Christian, fixing him in place while being buffeted by worldly concerns, uncertainty, even persecution. The anchor of Christian hope prevents us from losing our way or running aground. 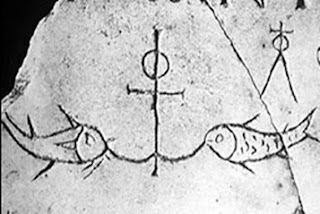 Often, the symbol of the anchor is accompanied by a fish, one of the earliest symbols of Christ and an embodiment of his self-offering for our sake. The anchor is a timely symbol to contemplate during the Advent season, as we watch in hope for Christ's coming at Christmas, and anticipate his second coming in glory. On November 21st, 2009, the 10th anniversary of Pope John Paul II's Letter to Artists, and the 45th anniversary of Pope Paul VI's similar meeting with artists, Pope Benedict XVI met with some 250 artists from around the world in the Sistine Chapel. The intent of this meeting, in his words, was "to confirm the friendship between the Church and the arts." He maintained the need for artists in the Church "in order to carry out our ministry...preaching and rendering accessible and comprehensible to the minds and hearts of our people the things of the spirit, the invisible, the ineffable, the things of God himself." In this regard, he continued, there is a particular need for an authentic beauty in the arts, since beauty is "a path towards the transcendent, towards the ultimate Mystery, towards God." As "custodians of beauty" artists "are to be heralds and witnesses of hope for humanity." The full text of this address is now available in English by clicking here.